A multi-dimension man, for sure, but dark-skinned with a beard? That's someone else's ghost. Last I saw him he had a beard, so halfway there. 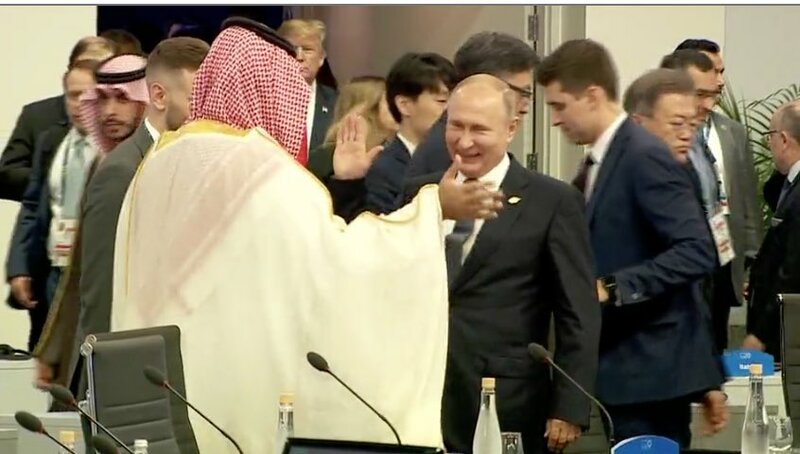 Gotta love this picture of MBS and Putin this morning at the G20. Remember the good old days when the US stood up to thugs? Macon's just as bad. They all seem to be falling over themselves vying to see who can be MbS's chief fartcatcher. Oh yeah, they handled Stalin real well. Clinton/Bush/Obama had a stranglehold on China, too, sending them waves of production to keep them too busy to engage in human rights violations. Rwanda? What's that? Pol Pot almost got a talking to. Back then America might have rolled over in private but at least their public posturing was tough. Trump's schoolgirl infatuation with Putin and MbS is embarrassing and unprecedented. A lot worse than Rumsfeld shaking Saddam's hand in the '80s. I don't know what Rumsfeld has to do with anything since both the US and the Saudi's were backing Saddam's war with Iran in the 80's and the US green-lighted his invasion of Kuwait. A handshake or two were in order, but the 80’s rabbit hole goes deep. I don't mean to be a jerk, but this 'schoolgirl' that or 'unprecedented' this kind of talk has worn thin. What's a statement like that even supposed to mean? In the context of geopolitical aggression or lack thereof over generations and, as you say, a public showing being all about optics and a means of humouring the masses rather than anything tangible or ultimately worthwhile, what Trump says or does before the cameras is irrelevant, is it not? All presidents act like schoolgirls and all are guilty of unprecedented decisions or actions/inactions if history has taught us anything and we acknowledge their actions are mere showmanship. Montreal-based dissident Omar Abdulaziz was targeted by Israeli cyber intelligence firm NSO Group's Pegasus spyware software, which enables hackers to access messages, photos, microphone, and camera, researchers at Toronto's Citizen Lab found in October. Abdulaziz and Khashoggi were in communication during the period of time that his phone was allegedly hacked, and he told CNN that the breach may have provided Saudi agents with sensitive information that contributed to Khashoggi's murder. "The hacking of my phone played a major role in what happened to Jamal, I am really sorry to say," Abdulaziz told CNN. "The guilt is killing me." "NSO should be held accountable in order to protect the lives of political dissidents, journalists and human rights activists," Abdulaziz's lawyer Alaa Mahajna told CNN. NSA whistleblower Edward Snowden also spoke firmly against the NSO Group, calling it "the worst of the worst," a seller of tools "being actively used to violate the human rights of dissidents, opposition figures, activists, to some pretty bad players." He also alleged that the group's technology was used to help track and eventually kill Khashoggi. The Canadian researchers who reported that Israeli software was used to spy on Washington Post journalist Jamal Khashoggi's inner circle before his gruesome death are being targeted in turn by international undercover operatives, The Associated Press has found. Citizen Lab Director Ron Deibert described the stunts as "a new low." "We condemn these sinister, underhanded activities in the strongest possible terms," he said in a statement Friday. "Such a deceitful attack on an academic group like the Citizen Lab is an attack on academic freedom everywhere." The first message reached Bahr Abdul Razzak, a Syrian refugee who works as a Citizen Lab researcher, on Dec. 6, when a man calling himself Gary Bowman got in touch via LinkedIn. The man described himself as a South African financial technology executive based in Madrid. "I came across your profile and think that the work you've done helping Syrian refugees and your extensive technical background could be a great fit for our new initiative," Bowman wrote. Abdul Razzak said he thought the proposal was a bit odd, but he eventually agreed to meet the man at Toronto's swanky Shangri-La Hotel on the morning of Dec. 18. Instead of talking about refugees, Abdul Razzak said, Bowman grilled him about his work for Citizen Lab and its investigations into the use of NSO's software. Abdul Razzak said Bowman appeared to be reading off cue cards, asking him if he was earning enough money and throwing out pointed questions about Israel, the war in Syria and Abdul Razzak's religiosity. "Do you pray?" Abdul Razzak recalled Bowman asking. "Why do you write only about NSO?" "Do you write about it because it's an Israeli company?" "Do you hate Israel?" Abdul Razzak said he emerged from the meeting feeling shaken. He alerted his Citizen Lab colleagues, who quickly determined that the breakfast get-together had been a ruse. Bowman's supposed Madrid-based company, FlameTech, had no web presence beyond a LinkedIn page, a handful of social media profiles and an entry in the business information platform Crunchbase. A reverse image search revealed that the profile picture of the man listed as FlameTech's chief executive, Mauricio Alonso, was a stock photograph. TOP secret nuclear talks between Donald Trump and the Saudi government triggered journalist Jamal Khashoggi’s murder, a security expert has claimed. Mr Wilson writes: “He had been privy to many Saudi secrets as a confidant of Prince Turki al-Faisal, Saudi Arabia’s long-standing intelligence chief, and had also been his adviser when he was Saudi ambassador to first London then Washington. “All this raises the question of whether Khashoggi knew too much. “Was he party to some damaging secret that his one-time friends in Riyadh feared he might spill unless silenced? Mr Khashoggi fled to the US giving the Saudis concerns that he had insight “into the kingdom’s long-held desire to develop a nuclear capability, as a counterweight to the nuclear bomb ambitions of Iran, its number one enemy”. Mr Wilson adds: “He might also have been aware of Trump’s keenness to sell nuclear technology to them. LONDON/DUBAI (Reuters) - Saudi Arabia is threatening to sell its oil in currencies other than the dollar if Washington passes a bill exposing OPEC members to U.S. antitrust lawsuits, three sources familiar with Saudi energy policy said. They said the option had been discussed internally by senior Saudi energy officials in recent months. Two of the sources said the plan had been discussed with OPEC members and one source briefed on Saudi oil policy said Riyadh had also communicated the threat to senior U.S. energy officials. In the unlikely event Riyadh were to ditch the dollar, it would undermine the its status as the world’s main reserve currency, reduce Washington’s clout in global trade and weaken its ability to enforce sanctions on nation states. “The Saudis know they have the dollar as the nuclear option,” one of the sources familiar with the matter said. “The Saudis say: let the Americans pass NOPEC and it would be the U.S. economy that would fall apart,” another source said.